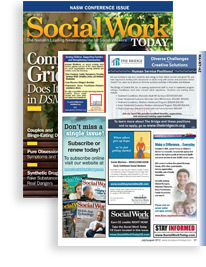 An essential resource for more than 85,000 professionals, Social Work Today is the only national trade magazine committed to exploringissues concerning the entire social work profession through expert andconcise editorial content. For recruiters looking to connect with qualified social workers for a facility or client, Social Work Today is the premier resource for presenting current opportunities to this influential community of professionals, whether they’re active or passive job seekers. A valuable asset to any recruitment campaign, each print issue of Social Work Today offers double exposure through our digital companion, which is posted each month on this website.